Looking for knee high boots that are cruelty free without the real leather or fur? Here are 7 vegan knee high boots you're going to absolutely love. Be sure to check out #5 if you want something super comfy! 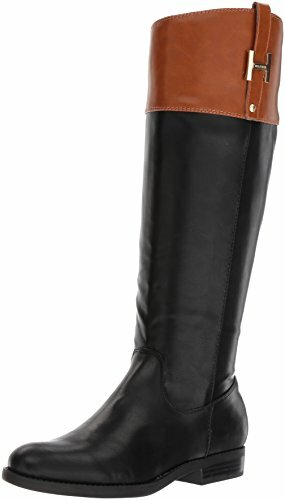 Women's black equestrian riding boot with brown cuff and low stacked heel. Has a gold Tommy Hilfiger "H" emblem on the cuff. Made of synthetic material that looks like leather. Inner side zipper goes all the way down so you can easily peel this boot off. Pros: Well constructed — these boots will keep their shape. Very comfortable and walkable on fairly uneven terrain (think dirt roads). At home in the woods but elegant and sophisticated enough to wear in a city setting. Try them with a short a-line skirt or black leggings. Cons: Not for cold, wet seasons as snow or high water will likely seep through. May run narrow. Women's shiny silver knee boot with low black platform heel and black laces from the foot to the cuff. Full length zipper on the inner side of the boot allows for easy access. Has a rounded cap toe and silver studs around the edge of the outsole. Insole has light padding for added comfort. Durable outsole with good traction for walking around outside. Pros: Laces allow you to tighten or loosen the boots as needed to fit the contour of your calves. Glam style for fashion-conscious settings — these would look great with a flowy mini dress. Probably won't give you trouble even after a full day of walking. Cons: Seem likely to go with a limited wardrobe. Women's black knee high boot with 3" stiletto heel in black. Smooth synthetic material with a matte finish. Pointed toe gives this boot a classic feminine look. Has a black inner side zipper extending from the sole to about mid-way up the calf. Rubber outsole provides grip on the ground. Advertised as vegan: No. Materials are all man-made. Pros: Stretchy so that you can get your leg in without an issue. Great for feeling like you're on the catwalk everywhere you go. Pair these boots with a dress or tucked-in skinny jeans. Cons: Narrow in the foot and expensive, chic as they are. Women's caramel color winter knee high boot made of faux leather. Stylish faux fur trim on the back of the calf. Lace-up front and full-length inner side zipper for a perfect fit. Low stacked rubber heel provides grip and stability. Padded footbed for comfortable wear. Advertised as vegan: No, but the materials are faux leather, faux fur, rubber and textile. Pros: Warm enough to wear in cold environments. The cool old fashioned look works well with relaxed fit jeans or with leggings. Cons: Not suggested for use as a snow boot so much as a fashionable cold weather leisure boot. 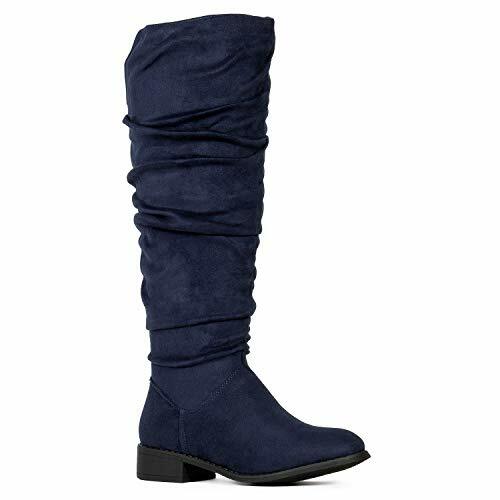 Women's slouchy navy blue knee high boot with a rounded almond toe. Made of soft fabric with ruching from the top of the boot to the ankle. Comfortable stability with a low stacked rubber heel. Cool hidden pockets on the inside of the boot (toward the top) that you can stash your phone, credit cards and cash in. Cushioned insole and slip-resistant outsole. Partial zipper at the ankle on the inner side to help make the boot easier to get into. Pros: Very fashion-forward and wearable with just about anything in your wardrobe. Good for casual, everyday use. The suede-like material is super soft against the skin and the inner pockets are a fantastic idea that make it so you might not even need to carry a purse when you go out. Cons: Might be a little snug in the calves. Women's dark brown leather-like knee high boot with low chunky heel. Zips from top to bottom on the inner side of the boot. Has trendy crisscross straps with silver buckles on the outer side at the ankle. Thin strip of stretchy elastic material running the length of the boot (toward the back) ensures that putting it on is struggle-free. Advertised as vegan: No. However, the boots are all synthetic and textile. Pros: Super comfortable and great for a laid-back look. Use these as work boots, motorcycle boots or fashion footwear. Price is moderately inexpensive. 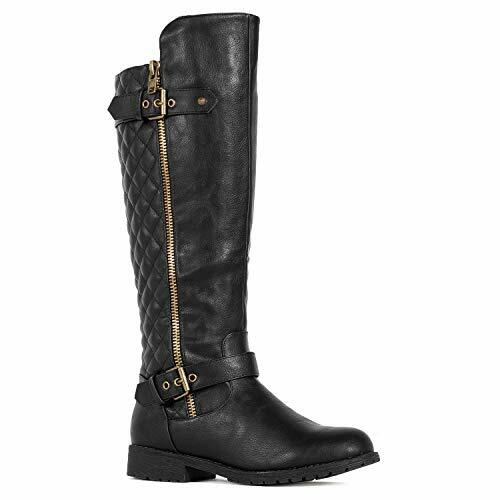 Women's black riding boot with quilting on the back half of the calf and textured, leather-like material on the front. Functional inner side zipper and a snazzy gold zipper (just for style) along the outer side of the boot. Two gold buckles on the outer side of the boot: one at the top and one at the ankle. Low, supportive heel made of anti-slip rubber. Hidden 6" x 3" pockets on the inside of the boot to tuck away necessities. Pros: You don't need to have a narrow calf for these boots, and that tends to be difficult to find. Good for comfortable, all-day wear. The quilting is refreshingly different. Complete the biker look with jeans and a faux leather jacket. Cons: Not much versatility — these boots fit a pretty specific equestrian-bike-babe aesthetic.